Chip Ganassi Racing announced Friday that Swedish driver Felix Rosenqvist will drive the team’s No. 10 NTT DATA Honda beginning in the 2019 IndyCar Series season as a teammate with reigning series champion Scott Dixon. CGR also announced a multiyear extension that will see NTT DATA remain a primary partner. Rosenqvist, 26, boasts a lengthy racing resume that includes FIA European Formula 3, the DTM European touring car series and FIA ABB Formula E. The native of Varnamo, Sweden, won the 2015 Formula 3 championship and accumulated 28 wins in four seasons. He is also a two-time winner of both the prestigious Masters of Formula 3 and Macau Grand Prix races. Rosenqvist has driven the past two seasons in Formula E for Mahindra Racing, winning three events and placing third in the 2016-17 championship. He also drove for Belardi Auto Racing during the 2016 Indy Lights presented by Cooper Tires season, winning three of the 10 races in which he competed. He tested an Indy car twice for Chip Ganassi Racing, in 2016 and ’17 at Mid-Ohio Sports Car Course. “Felix has become familiar with our team and has worked in our system a little bit after coming over to test with us on a few occasions,” team owner Chip Ganassi said. “Our management and engineering groups, along with the entire team, were impressed by his ability. The time was right to get him in the No. 10 car, and I think I speak for a lot of people when I say that we are confident about what he can do behind the wheel next season. John McCain, chairman of NTT DATA Services, said his company is pleased with the extension as well. 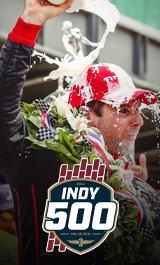 The 2019 IndyCar Series season consists of 17 races, beginning with the Firestone Grand Prix of St. Petersburg on March 10. The calendar is highlighted by the 103rd Indianapolis 500 on May 26, with the season finale set for Sept. 22 at WeatherTech Raceway Laguna Seca.